Bill Davis grew up in Clinton, South Carolina, not far from Earle Gaulden’s hometown of Laurens. As a student of architecture at Clemson University in the late 50’s, he studied under Greenville practitioner and Clemson studio lecturer Kirk Craig. Graduation led to two years in the Army’s 101st Airborne Division where Bill says, despite being a track athlete in school, he really learned to run. After a few years interning in Charlotte, Bill received the phone call beckoning him home to the Upstate. He began work at Craig and Gaulden Architects on January 1, 1966. By 1978, the firm’s title bore his name, and Craig, Gaulden & Davis Architects had local and regional repute as a leading design firm. Over the decades, Bill’s hand was instrumental in the design and realization of countless Upstate schools, his forte, and Greenville architectural jewels such as the County Museum of Art and the Peace Center for the Performing Arts. Bill recalls fondly his close bond with Kirk and Earle and acknowledges they simply had fun together. By the early 90’s though, Bill’s handiwork and passion in an admittedly disparate field began to prove ripe for business venture. Bill’s son Tom began home brewing in the early 90’s. Following a successful Christmas party homebrew debut, Bill and Tom began brewing on a larger scale for a Greenville brewpub; interest and demand only grew. In 1998, Thomas Creek Brewery launched as a full-fledged microbrewery, one of the Southeast’s earliest entries into the craft beer scene. Bill began full-time management of the brewery in 2004. When asked to consider the unique design process and approach architects bring to problem solving and apply it to running a brewery, Bill candidly grants that it’s just different. But, his penchant for design and craft remain strong. He concedes that he still cannot walk into a building without forming a critique, and he still enjoys his longtime hobby of throwing pottery. Besides sharing the more impalpable legacy of Bill Davis, CGD and Thomas Creek are both proud to have some of his very tangible hand thrown mugs in the cabinets and behind the bar, respectively. When encountering the humble and affable demeanor of Bill Davis, one might find that conversation easily drifts to stories about the amiable pack of dogs for whom Thomas Creek is a second home or Bill’s self-deprecating tales of navigating the three story home of his own design, built when he was admittedly more nimble. Yet, behind the congenial character and anecdotes is someone who has contributed lasting regional impact and pushed the envelope in the fields of building design and brewing. It’s only fitting that Bill’s first beer was enjoyed alongside his architecture studio professor and classmates at Clemson’s Esso Club in 1956, then a functioning service station serving beer out of the backroom. 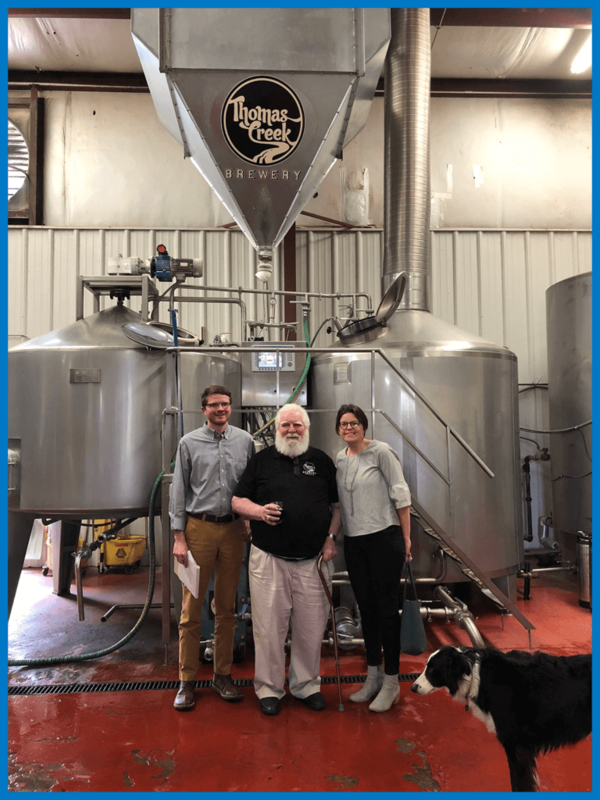 Though unwitting, all were witness to a brief microcosm of what would define Bill’s ensuing sixty-plus years: impactful architecture and great beer in the friendly environs of Upstate South Carolina.